As we wave goodbye to summer vibes, we say hello to fall and winter…and with the change of seasons we inspire a change within ourselves too! Health and Beauty is an investment all year round, an investment we make for our health and greater good as we move from one day to the next. Ensuring we have a brighter tomorrow always depends on what we do today to rejuvenate, energize, and nourish ourselves. It’s never as complicated as it seems- all our bodies ever ask for is some attentive concern and steps forward to a healthier way of being. So, in order to “be”…we must also do! Whatever plans or goals we began or began implementing through summer need to be revisited and touched up where needed. Are your goals still your goals? Perhaps your objectives have changed, and as we age we naturally need to take better care of ourselves so we need to reset our thinking and forthcoming actions as required! How can you rejuvenate for a brighter tomorrow? Think about it…and simply begin to do! And if you need a little nudge…We’ve outlined some pointers just for you! Use the change of season as an opportunity to reset, restore, and renew. Are you still moving forward toward your goals? Is a new health/beauty regimen that you previously implemented working well for you? We can only evolve by learning as we go along if there is anything we need to tweak then nature’s change can inspire us to do just that! This could be as simple as incorporating more seasonal veg into your diet, adjusting the time, length, intensity or frequency of your workouts, or just trying out a new product that is suitable for your skin as the temperatures take a bit of a drive through fall into winter. Fall teaches us to release what we no longer need; just as the leaves fall so effortlessly from the trees, we can also encourage ourselves to let go of old habits and patterns that do not serve our greater good. The inner you will always show on your external appearance. Stress greatly impacts our health and ages us, day by day. If you have had a busy summer, take some time to focus on creating a greater sense of balance and harmony within you- and taking some downtime when needed can only do this. We don’t always need to be “all go”, we have no on/off switch yet by purposefully becoming aware of our thoughts and feelings, we can become a happier, more confident version of ourselves. Rejuvenation always begins from within. We could be eating well, exercising regularly, sleeping the recommended 8 hours each evening, but unless we work on our inner compass of health we will still invite imbalance into our mind, body, and spirit! Feeling fresh and renewed is a state of mind-body connection that we focus upon and enhance. If you can work on your mind and spirit, RejuvenPure can help you with your body and skin care! RejuvenPure believe in feeling and looking good…here’s a glimpse at how they can help you gain a healthy momentum! RejuvenPure feel that many skin care products and nutritional supplements nowadays are filled with chemicals that don’t actually help you. They strongly believe that quality should never be a compromise! That’s why they made it their passion to offer effective nutrient-rich anti-aging skin care and premium nutritional supplements to help you look good and feel good! And, not only are their skin care products made with natural ingredients, but they are also unscented which is highly beneficial to those with allergies or sensitive skin. “We spent several years researching anti-aging skin care and nutritional supplements, and it became our mission to offer what we feel are the best anti-aging skin care and nutritional supplements available on the market today to help you look and feel your best! We were very excited to launch our website this year. Our products can also be found on Amazon and…good news- we ship anywhere within the United States!” said RejuvenPure. At RejuvenPure, it is their priority to use only the highest quality ingredients in their products because they know that your health matters. Additionally, their integral belief is that maintaining a healthy lifestyle should be affordable, so they work extra hard to maintain economical prices. Their products are carefully formulated to yield maximum results without containing fillers, binders, or artificial ingredients. Hair Skin Nails: The combination of vitamins in our Hair Skin Nails eliminates the hassle of taking multiple supplements to help your hair, skin, and nails reach their amazing beauty! 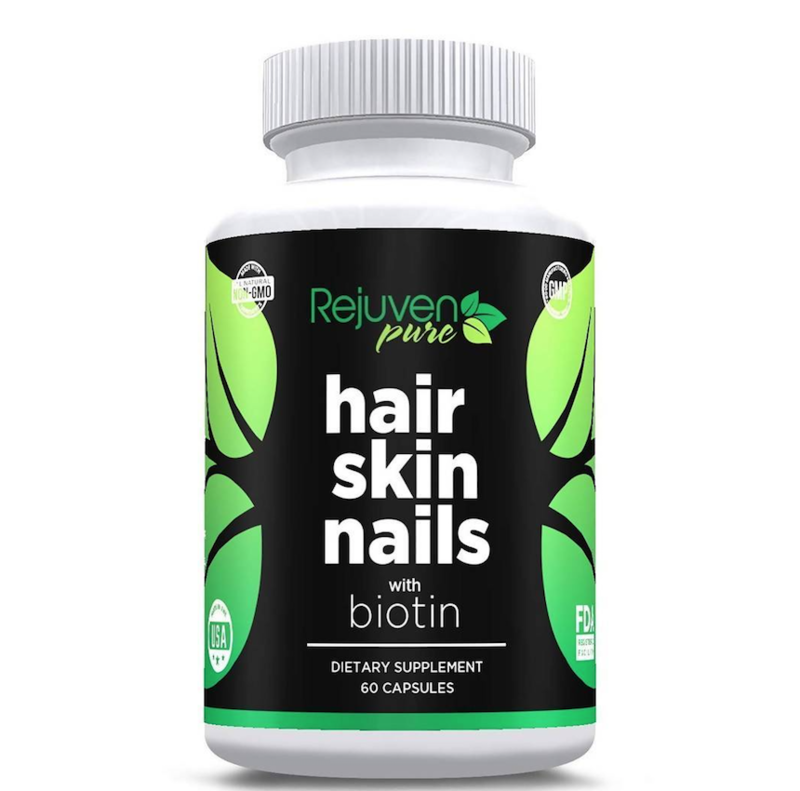 This supplement is a natural blend of vitamin B6, Folic acid, and Biotin to help strengthen your nails, grow healthier hair, and give your skin a natural glow. Vitamin B6 is one of the main vitamins responsible for functions in the body like red blood cell growth, healthy brain and nervous system function, and protein uptake. Folic acid, another kind of B vitamin, has been used for years to help prevent and treat low blood levels of folic acid, which at a certain point can lead to liver and kidney disease. Biotin plays a key role in the body, as the main support for healthy skin, hair, and nails. Biotin, branded as the “miracle cure for hair growth”, has been shown to not only help hair grow fast but also helps protect against dryness in the hair. It increases the elasticity of your hair, preventing further breakage. Not only are you helping your Hair Skin and Nails reach their amazing beauty, but you are also supporting vital functions on the inside for a healthier you! RejuvenPure, strive to stay on top of current research to deliver the latest and greatest products to their customers. Their products are manufactured in the USA in an FDA certified, GMP (Good Manufacturing Practices) compliant lab.